Yeah, like that was gonna happen. Lear, 93 at the time, surely would run into dead ends when pitching this to any broadcast or cable network that even deigned to take a meeting with him. Some high level executives might not even have been aware of Lear’s original One Day At a Time, which aired from December 1975 until May 1984 on CBS. “Institutional memories” aren’t what they used to be. But many of us didn’t take into account the Great Equalizer -- Netflix. It doesn’t particularly care if some of its shows “skew old.” Nor is Netflix afraid of retro. It’s already the home of Fuller House, a continuation of Gilmore Girls and The Ranch, a throwback, “multi-camera” sitcom reuniting That ’70s Show co-stars Ashton Kutcher and Danny Masterson. Netflix also has bought into Grace & Frankie, which arguably skews north of Forest Lawn with a principal cast of Jane Fonda, Lily Tomlin, Sam Waterston and Martin Sheen. And it’s given Longmire a multi-season reprieve after A&E dropped it because the core audience was deemed too old. So in that context, here indeed comes the “re-imagined” One Day At a Time, whose 13 Season One episodes start streaming on Friday, Jan. 6th. It turns out to be a far livelier, amusing and substantive sitcom than expected, even with the additional old trapping of an over-exuberant laugh track. Justina Machado heads the cast as single mom Penelope Alvarez, who’s returned from Army duty in Afghanistan and now works as a nurse in a small clinic run by the ever befuddled Dr. Berkowitz (Stephen Tobolowsky). Back home in a small apartment, Penelope’s traditionalist Cuban mother Lydia (Rita Moreno) does much of the cooking and housecleaning while clinging firmly to “the old ways.” Penelope’s two kids are studious social activist Elena (Isabella Gomez) and younger brother Alex (Marcel Ruiz), who’s still finding his way. The only carryover character from the original series is handyman Dwayne Schneider (Todd Grinnell), an amiable moocher and sometime confidant. This new version is aggressively cultural, at times a little too preachy and always affixed with a happy, hug-spiked ending, based on the four episodes I’ve viewed. But the writing can be quite sharp while the performances -- most notably by Machado and Moreno -- add extra nuance and spice. Episode 3 is particularly strong, beginning with 70-year-old Lydia’s morning ritual of making breakfast while gyrating to the Cuban tunes she loves. She also continues to adorn the apartment with Catholicism, including a picture of Pope Francis on the refrigerator. “My apartment looks like Jesus’s Pinterest page!” Penelope carps. 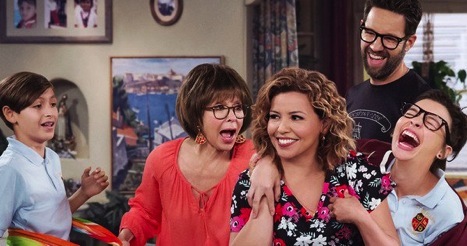 The new One Day At a Time also tackles workplace sexism, being true to one’s self and, in Episode 1, Elena’s extreme reluctance to be a part of Quinceanera. Both her grandma and mother have participated in this time-honored Hispanic celebration of a girl’s 15th birthday. In Elena’s view, though, it’s nothing than a “misogynist cultural ritual” played out before slobbering teenage boys. Episode 4 is mostly about 38-year-old Penelope’s planned first date since separating from her husband. It’s buoyed by a flashback to Lydia’s first encounter with her future and now deceased husband, and an imagined current-day meeting where they affectingly discuss their daughter’s latest tribulations. Machado, and particularly Moreno, are likely to be Emmy contenders for their vivid performances in these two lead roles. And Lear, after all these years, perhaps at last has a predominately Hispanic comedy series that also will be a long-distance runner. He tried once before, in 1984, with a. k. a. Pablo, a heavily panned ABC show that deservedly lasted for just six episodes. The man who also developed All in the Family, Maude, The Jeffersons, Good Times and Sanford and Son has nothing left to prove in terms of his TV legacy. But this second coming of One Day At a Time would be quite a curtain call if Netflix decides to proceed beyond Season One. So far, muy bueno. Somewhat amazingly, this turns out to be a comedy whose time has come again.